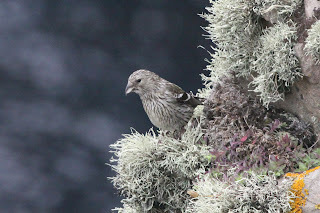 Fair Isle Bird Observatory: the Warden's diary: Autumn underway. Well worth dashing straight out the house for as soon as I got back. I also managed to catch up on one of the other birds I missed, with the start of census today seeing the reappearance of seven of the Two-barred Crossbills on Hoini, the undoubted highlight of my South-west census. 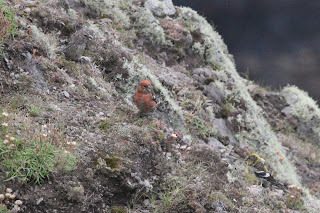 A flock of 16 'crossbills' feeding on the sheer cliff faces of Hoini contained at least 7 Two-barred Crossbills and 5 Common Crossbills, but as the flock split up and groups were often out of sight, the remaining birds went unidentified (for now). 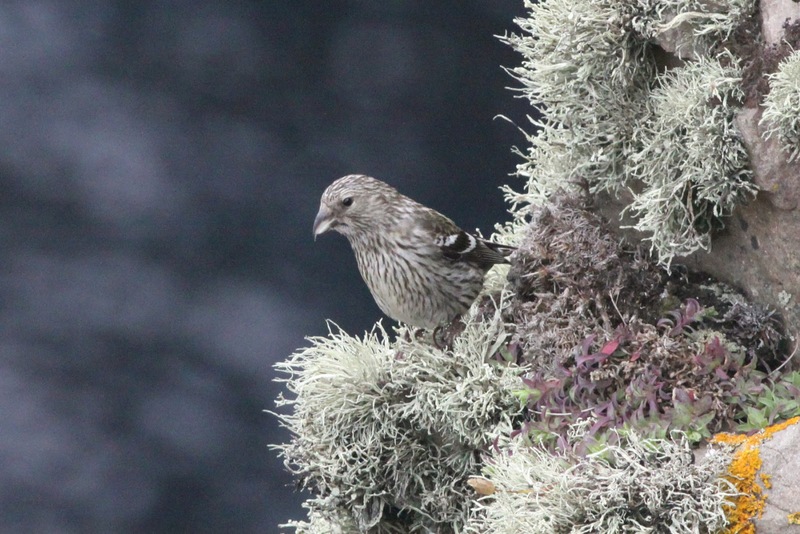 When first found last week, the Two-barred Crossbills were not mixing with Common Crossbills, although up to 18 of the latter had been noted around the island. Although their location made seeing the whole flock difficult, the birds weren't shy, with some showing very well (including this juvenile). 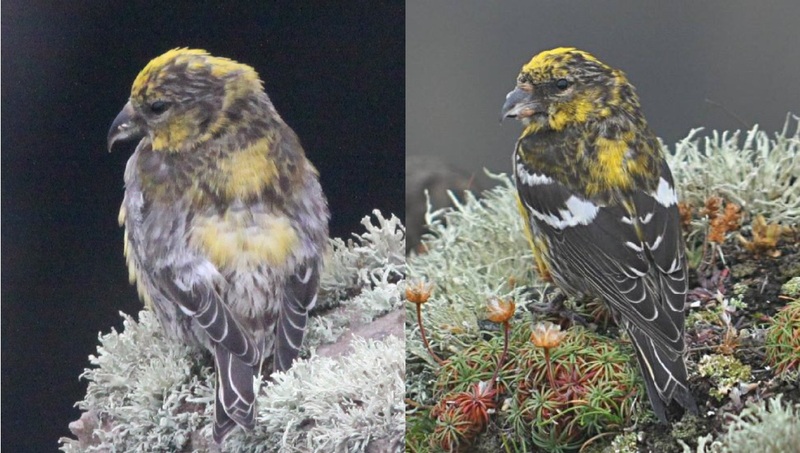 Although the flock of 8 were only seen from 26th-28th, the photo of one of the original birds (right, by Daniel McGibbon) shows it to be the same as one of the birds seen today (left). 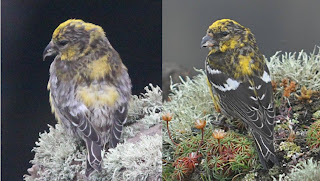 Although the bird in the photo taken today is hiding its wing bars, the similarities in the visible wing feathers and pattern of the emerging adult yellow feathers show it to be the same bird. ﻿The Stormie sessions have been going well, with up to 100 trapped in a night and Leach’s Petrels have put in daily (or nightly at least) appearances, with 15 trapped (14 ‘new’ birds and one returning bird from last year). 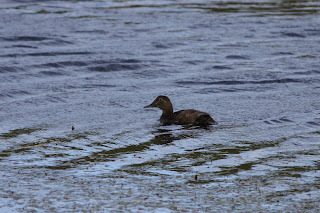 A quick session at the mistnets in the Obs garden on the evening of 31st also saw a pleasant selection of birds caught, including a Marsh Warbler (the juvenile that has been at the Obs since 27th July and is still present today) and two Mealy Redpolls. Only two weeks passed between the last of the spring Marsh Warblers departing Fair Isle and the first of the autumn migrants turning up! 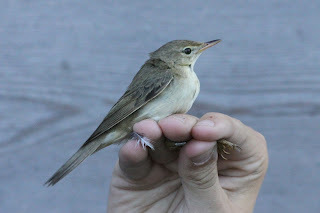 Other birds around recently include the Subalpine Warbler (until 31st July at least), Icterine Warbler at Schoolton (26th-30th at least) and the two summering Tree Sparrows. A small amount of wader passage has included our first Ruff of the year (30th July at Barkland), 2 Greenshank (30th), up to 2 Green Sandpiper (from 25th), Bar-tailed Godwit (30th) and Common Sandpiper (26th and 30th). 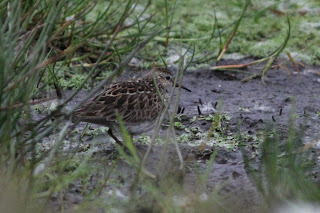 The Pectoral Sandpiper that turned up for a couple of days just before I went away. 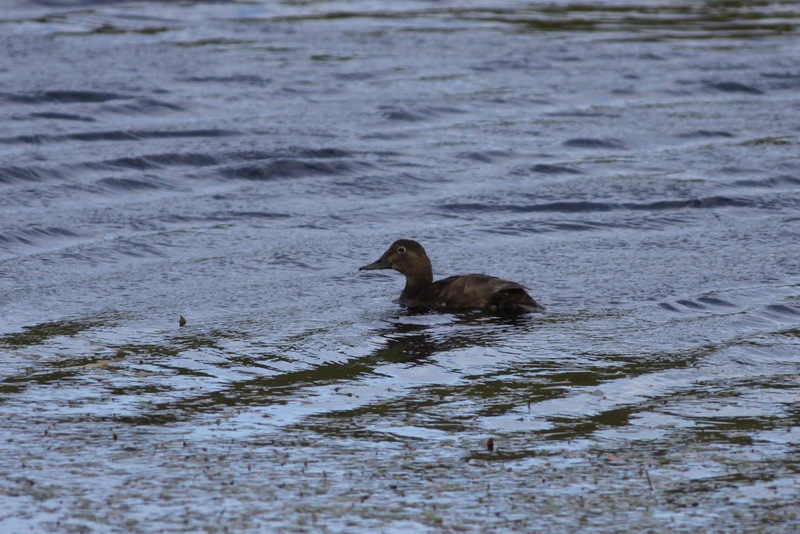 August can be a good month for other scarce waders to come through.